There are many different kinds of supplements: whole foods and synthetics; vitamins and minerals; essential fatty acids; green blends; digestive aids; and combinations of the above. The best supplements for your dog will depend on the diet you feed and your dog's individual health. Just as with food, I think it's better to rotate between supplements rather than always giving the same ones. Try to find at least two or three that your dog does well with, and switch off between them, maybe each time you finish a bottle. If you feed a commercial diet, you should consider supplementing with fresh foods, rather than (or in addition to) vitamin supplements. See Adding Fresh Foods to a Commercial Diet for more information. For more information on supplements to add to a homemade diet, see Homemade Diets: Supplements. An important source of omega-3 essential fatty acids EPA and DHA. Omega-3 EFAs are beneficial to the immune system, the nervous system, the heart, and help stop inflammation, such as in arthritis and allergies. They also support brain development of puppies and fetuses. This is probably the most important supplement to give, no matter what you feed, as Omega-3 EFAs are hard to find even in a natural diet, and are highly perishable when exposed to heat, light or air, so they do not survive in commercial foods even if added. See Something Fishy for a summary of proven benefits from fish oil. Omega-3 EFAs are found primarily in fish oil. Most fish oil gelcaps have 300 mg EPA and DHA combined. Some concentrated versions, such as Sogeval's Derma-3 Twist Caps (small dog version has 450 mg EPA/DHA in 0.8 grams of oil; large dog formula has 890 mg EPA/DHA in 1.5 grams of oil) and GNC Triple Strength Fish Oil 1500 (900 mg EPA/DHA in 1.5 grams of oil) (also available at Amazon) have more, while salmon oil often has just 200 mg per gram of oil. For very small dogs, Stratford Omega-V3 for Small & Medium Dogs & Cats has less oil (about 700 mg), with 200 mg EPA/DHA per gelcap (they also make more concentrated Twist-Off and EZ-Chew versions with 450 mg EPA/DHA each, as well as a liquid that is not concentrated -- the chewable version would be easier to split, but the omega-3 fatty acids might not hold up as well in a chew, while the liquid is easy to dose small amounts, but has less EPA/DHA per gram of oil and won't last more than a couple of months in the refrigerator). Cod liver oil also provides omega-3 fatty acids, but most supplements are high in vitamins A and D as well, which limits the amount you can give. A typical cod liver oil gelcap might contain 200 IUs EPA and DHA combined, along with 2,000 IU vitamin A and 250 IU vitamin D. You could give one of these to a medium-sized dog, but you would need to add fish oil, such as salmon oil or EPA oil, if you wanted to increase the amount of omega-3 fatty acids due to health problems such as inflammation, kidney disease, or cancer. There are exceptions, however, as molecular distillation removes the vitamins from the oil. For example, Nordic Naturals Cod Liver Oil is quite low in vitamins A and D with the same amount of omega-3 fatty acids, and so it would be fine to give more of these when needed. One form of omega-3 fatty acids called ALA is found in flax seed oil, but dogs cannot use ALA unless it is first converted to EPA. At best, dogs convert 15% of ALA to EPA, and some dogs may not be able to make this conversion at all. For this reason, fish oil is a much better source of omega-3 fatty acids for dogs than flaxseed oil. Recommended dosage is 1000 mg fish oil (containing 300 mg combined EPA/DHA) per 30 pounds (14 kg) of body weight. Maximum dosage for dogs with health problems would be 1000 mg fish oil (300 mg EPA/DHA) per 10 pounds (4.5 kg) of body weight. You can also use sardines in place of fish oil supplements; one small sardine supplies over 100 mg EPA/DHA. I don't recommend any particular brand of fish oil. The ConsumerLab.com review of Fish Oil/Omega-3 Supplements done in 2008 showed that "all were fresh and contained their claimed amounts of EPA and DHA . . . None of the products were found to contain detectable levels of mercury [over 10 ppb (parts per billion). . . . ). In addition, none of the products contained unsafe levels of lead or PCBs." However, an updated report in 2012 found, "Trace levels of PCBs were found in every product (as PCBs are ubiquitous in water), but two supplements exceeded contaminations limits for PCBs. Mercury was not detected in any of the products." Some people prefer to get molecularly distilled fish oil, which is fine, but I don't think it's necessary (note that the term "pharmaceutical grade" does not have a legal definition). If you prefer liquid fish oil, be sure to buy products in dark bottles and keep them refrigerated. Don't buy more than you will use in a couple of months, as fish oil will become rancid over time when exposed to light, heat, or air. See K9RawDiet.com for some good brands (this site belongs to a friend of mine). Vitamin E should also be given whenever oils are supplemented. Just 10 IUs of vitamin E should be enough to balance one teaspoon or 5 grams of oil, but more may be beneficial. See Vitamin E below for more information. My recommendations for vitamin E are continually evoloving. I initially recommended giving 100 IUs to small dogs (less to really tiny dogs), 200 IUs to medium-sized dogs, and 400 IUs to large dogs daily. Then I read a human study that showed megadoses (400 IUs or more daily) of vitamin E in adult humans caused it to act as a pro-oxidant rather than an anti-oxidant, and I revised my recommendations downward, to 1-2 IUs per pound of body weight daily. I still think this amount is appropriate for most healthy dogs. See Meta-analysis: high-dosage vitamin E supplementation may increase all-cause mortality (Study Shows High-Dose Vitamin E Supplements May Increase Risk of Dying) and The questionable association of vitamin E supplementation and mortality--inconsistent results of different meta-analytic approaches for overviews with varying conclusions. Newer studies done on dogs show that higher amounts of vitamin E can be beneficial, at least in the short term. One study done on dogs with atopic dermatitics (skin problems caused by enviromental allergies) showed that they had low levels of vitamin E in the body, along with high levels of oxidative stress markers. This study showed that giving 8.1 IU/kg (17.8 IU/lb) of body weight daily for eight weeks increased levels of vitamin E in the blood and decreased pruritis (itching) in dogs with environmental allergies. See Vitamin E supplementation in canine atopic dermatitis: improvement of clinical signs and effects on oxidative stress markers. Another study showed that giving approxmiately 9 to 12 times the amount of vitamin E required by AAFCO nutrient guidelines for six weeks improved their antioxidant status and reduced an indicator of lipid peroxidation. This amount works out to 5-7 IUs per pound (50-70 IUs daily) for a 10-pound dog, and 3-4 IUs per pound (300-400 IUs daily) for a dog weighing 100 lbs (small dogs need more of everything for their weight than large dogs do). See Effect of increasing dietary antioxidants on concentrations of vitamin E and total alkenals in serum of dogs and cats and the synopsis, Antioxidant Benefits for Adult Dogs Study Synopsis for more info. The synopsis also talks about a study done on puppies given 10 times the amount of vitamin E required by AAFCO guidelines, along with vitamin C, beta carotene, and selenium (all antioxidants) improved immune response to vaccinations, along with higher concentrations of vitamin E in their blood. My concern with these studies is that they were only done short term, and some were done with dogs being fed grocery-brand kibble, which would likely have the highest amount of oxidized fats. We don't know if giving such high doses of vitamin E long term would remain beneficial, or if giving high doses of vitamin E to dogs with less oxidative stress might eventually cause harm. For healthy dogs, particularly those eating a fresh food diet, 1-2 IUs per pound of body weight daily (or an equivalent amount less often) is likely plenty. Healthy dogs eating kibble, especially small dogs, might benefit from slightly higher amounts. 10 lbs: 50-70 IUs daily, or 200 IUs every 3-4 days, or 400 IUs once a week. 20 lbs: 85-115 IUs daily, or 200 IUs every other day, or 400 IUs twice a week. 30 lbs: 120-150 IUs daily, or 200 IUs every other day, or 400 IUs every 3 days. 40 lbs: 150-200 IUs daily, or 400 IUs every 2 or 3 days. 50 lbs: 170-230 IUs daily, or 400 IUs every other day. 60 lbs: 200-265 IUs daily, or 400 IUs every other day up to 5 times a week. 70 lbs: 220-300 IUs daily, or 400 IUs every other day up to 5 times a week. 80 lbs: 250-330 IUs daily, or 400 IUs up to 6 times a week. 90 lbs: 265-360 IUs daily, or 400 IUs up to 6 times a week. 100 lbs: 300-400 IUs daily. 125 lbs: 340-470 IUs daily. 150 lbs: 400-525 IUs daily. Vitamin E may be safest when natural forms of mixed tocopherols, incuding gamma tocopherol, are used. Vitamin E may also be safer when giving in combination with other antioxidants, such as vitamin C.
For comparison, AAFCO guidelines require at least 12.5 IUs vitamin E per 1,000 kcal, which works out to a daily amount of 5 IUs for dogs weighing 10 lbs, 17 IUs for dogs weighing 50 lbs, and 29 IUs for dogs weighing 100 lbs. Amounts for puppies will be higher, as they need more calories for their weight. Probiotics are the beneficial bacteria that live in the intestines and help control yeast and harmful bacteria, as well as helping with digestion and intestinal health. These friendly bacteria are destroyed whenever antibiotics are given, and can also be flushed out of the system if your dog has diarrhea. Probiotics given for two weeks or longer following antibiotic usage may help restore populations; probiotics given while taking antibiotics may help prevent diarrhea caused by the antibiotics (give probiotics at least two hours apart from antibiotics). Dogs that are under stress or that have digestive problems or yeast overgrowth may benefit from routine probiotic supplementation. You can use products made for dogs, or human-grade probiotics that you would find in a health food store. There are two strains that have been shown to be beneficial for dogs: Bacillus coagulans (formerly called Lactobacillus sporogenes; available at Amazon) and Enterococcus faecium (found in many supplements, including Jarrow Formulas Pet Dophilus and Fortiflora from Purina, best price at EntirelyPets). (Note that despite its proven beneficial effects, E. faecium may be best used short-term due to possible issues with antibiotic resistance, opportunistic infections such as UTIs, and effects if transmitted to humans. Strain SF68 appears to be safer than other E. faecium strains.) Bifidobacterium animalis (found in Probiotic Miracle from Nusentia, available at Amazon) has also been shown to reduce the time for acute diarrhea to resolve. Supplements that also contain prebiotics, which are foods that nourish the beneficial bacteria themselves, such as FOS (fructooligosaccharides), chicory (found in Ark Naturals Gentle Digest and others), inulin, and larch (arabinogalactan -- see dosage for dogs here) may be especially helpful to dogs with diarrhea. Kefir, which is easy to make at home, is a good source of beneficial bacteria. Plain yogurt can also be used, though unless specific strains are identified on the label, the "live cultures" refer to those used to make the yogurt, not probiotics. 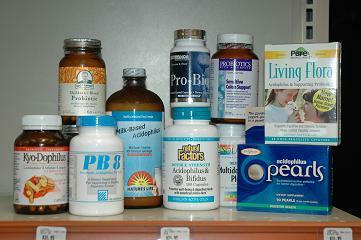 Some probiotics must be kept refrigerated; all should be kept away from heat, light and moisture. Most Lactobacillus, Bifidobacterium, and Streptococcus species do not need enteric coating as they can survive passage through the stomach. L. bulgaricus and S. thermophilus, as well as Leuconostoc and Lactococcus species, produce lactic acid which may help control harmful bacteria in the intestines and reduce diarrhea. Although commercial foods include a minimal supply of added vitamins (the original ones are mostly destroyed by processing), supplementing can be beneficial, especially vitamins E, C (with bioflavonoids), and B-complex. Unfortunately, many pet multi-vitamins, such as Pet Tabs, contain too little of these vitamins to be very useful. You need to be more careful about supplementing minerals, except in whole food form, due to the potential for overdosing or not using proper combinations (for example, zinc can be dangerous if given in large quantities or not properly balanced with copper). In general, I don't recommend supplementing individual minerals without a vet's OK, but the amounts contained in most multi-vitamin and mineral supplements should be safe. See below for some recommended brands. In general, if you feed a complete commercial diet of any kind, look for supplements made for dogs, with lots of vitamins and few minerals. If you feed a homemade diet, look either for supplements made specifically for dogs being fed a homemade diet, or use human supplements, both of which should include both vitamins and minerals. When using human supplements for dogs, adjust the amount based on weight: give the full human dose to a large dog; half the human dose to a medium-sized dog; one-quarter the human dose to a small dog; and one-eighth the human dose for toy breeds. Since enzymes are destroyed by cooking, commercial foods are enzyme dead. Adding digestive enzymes may be beneficial if your dog suffers from digestive disorders, liver problems, pancreatitis, or is otherwise unhealthy and may benefit from getting additional nutritional value from their food. Animal-based enzymes derived from pancreatin help more with the breakdown of nutrients, while plant-based enzymes, such as bromelain and papain, seem to help more with gas and inflammation. Note that while digestive enzymes are helpful for some dogs, they can cause digestive upset for other dogs. I generally recommend them only if you see improvement while using them. Whole food supplements use beneficial foods and herbs rather than synthetic vitamins. Green blends are whole food supplements that include primarily green foods, such as kelp, alfalfa, spirulina, etc. I think that whole food supplements may be especially good for dogs fed a commercial diet, since those diets already have synthetic vitamins added. Green blends are also good for dogs fed homemade diets that do not include vegetables. It is hard to quantify the benefits of whole food supplements since little in the way of measurable nutrients will show up on a nutritional analysis. Synthetic supplements generally offer much higher amounts of vitamins. If you want to provide high dosages of vitamin C, for example, you will have to rely on synthetic supplements to do so. Synthetic supplements that include high doses of minerals may be too much when feeding a commercial diet, as these can be overdosed. Human supplements are fine to give to pets as long as you adjust the dosage for their size. Give no more than half the human dosage to a 50-lb dog, and one-quarter the human dosage to a 25-lb dog if you feed a commercial diet. Very small dogs need products made for them to get the dosage right. For dogs fed a homemade diet, you can give a human one-a-day type of multivitamin supplement to dogs weighing 40 to 50 pounds, to help make up for what might be missing in the diet. Don't use children's products that contain xylitol, which is very toxic to dogs! Cholodin for canine cognitive dysfunction and helping to keep older dogs mentally alert. It contains choline and phosphatidylcholine, along with a few additional nutrients. See Alzheimer's in Dogs and Cats for more information. Also see Cognitive Disorder, Alzheimer’s Disease for more information on this topic from the same author. Animal Essentials Herbal Multi-Vitamin Also see their Animal Essentials Plant Enzymes and Probiotics. Available from K9RawDiet and Robbins Pet Care. Some Animal Essentials products are available from Amazon. Antioxidant Booster is a blend of powdered meeker raspberry seeds, vitamin E (d'alpha tocopherol) and Selenium. Canine & Feline All Food Fortifier Supplement from Nature's Logic. Contains a variety of whole foods, plus probiotics and digestive enzymes. Dr. Harvey's Golden Years Geriatric Supplement, E-mune Boost Immune Support Supplement, and MultiVitamin, Mineral & Herbal Supplement Available from Amazon. EverPup Ultimate Daily Dog Supplement from Functional Nutriments. A blend of whole foods, vitamins, minerals, and probiotics, designed for dogs over four years of age. Available from Amazon. Note this product appears to be the same as Nutrocept (sold only through veterinarians). Feed-sentials This is a "homemade" product by a GSD breeder in Toronto, Ontario. There are a few American distributors as well, such as Stalworth Kennels. It has everything but the kitchen sink, but the ingredients are all healthy. Invigor from The Honest Kitchen. Invigor is a whole food antioxidant blend. Also see their other whole food supplements, Sparkle (Skin & Coat Support) and Perfect Form (digestive support). All are available from K9RawDiet. Missing Link Available at some pet supply stores and also from Amazon. Nupro Available from Amazon. I have stated in the past that Nupro had too much vitamin D, but the company provided me with a more recent nutritional analysis showing this is no longer true. This supplement provides an appropriate amount of vitamins A, C, D and many of the B vitamins, along with an assortment of minerals. It is fine for adult dogs and puppies, whether added to commercial food or homemade. See Nupro Large Dog and Nupro Small Dog for nutritional analyses. PHD Wellness Wellness is a "Multiple Vitamin, Mineral / Herbal Blend" containing both whole foods and synthetic ingredients. Also see their Unleash probiotic and enzyme powder (also available in tablet form), Boost antioxidant formula, and Activator (formerly Endurance) supplement for working dogs. Available from Amazon. Rx Vitamins Nutritional Support Rx Vitamins supplements are frequently recommended by holistic vets. Available from Amazon. Standard Process Canine Whole Body Support Standard Process supplements are frequently recommended by holistic vets. Hard to find other than through vets, but now available from Amazon. Tiny Tabs Multivitamin from New Chapter. A whole-food, cultured multivitamin made for people but because the daily human dose is 6 tablets, is suitable for small dogs by giving fewer tablets. Volhard Immune Booster vitamin-mineral mix, Endurance supplement for working dogs, and Digestive Enzymes. Marketed by Handcraft Collars. Wholistic Canine Complete from The Wholistic Pet They also offer a Joint Mobility version that adds glucosamine, chondroitin and MSM in appropriate amounts. Available from Amazon. Wysong AddLife (same as C-Biotic with added protein) Also see Wysong's Call of the Wild supplement, which is designed to balance out all meat diets (home made diets that do not include bone), and their Wild Things veggie and fruit formula. See Dry Matter Analysis of Wysong Supplements for additional information. Addlife and Call of the Wild are available from Amazon. All Systems Go! Total Health Aid from Aunt Jeni's. All Systems Go! is a whole food green blend with herbs. Animal Essentials Organic Green Alternative Herbal Blend Available from Amazon. Ark Naturals Nu-Pet Canine Chewable Wafers and Granular Greens. Available from Amazon and Vitacost. Base Mixes from The Honest Kitchen. These are not supplements, but food mixes designed to be combined with meat and other fresh proteins to create a complete diet. They contain a variety of vegetables, fruits, herbs, and supplements (one variety also contains grains). Berte's Green Blend Berte's is a sea blend, may be high in iodine. DogZymes Cornucopia from Nature's Farmacy is an organic source of vegetables, herbs, grasses, and fruit that is free from corn, fillers, and preservatives. Dr. Billinghurst's E-BARF Plus Also available at The Dog Bowl and Duffy's Pet Food. EarthGreens and EarthOrigins from Urban Carnivore in Canada. 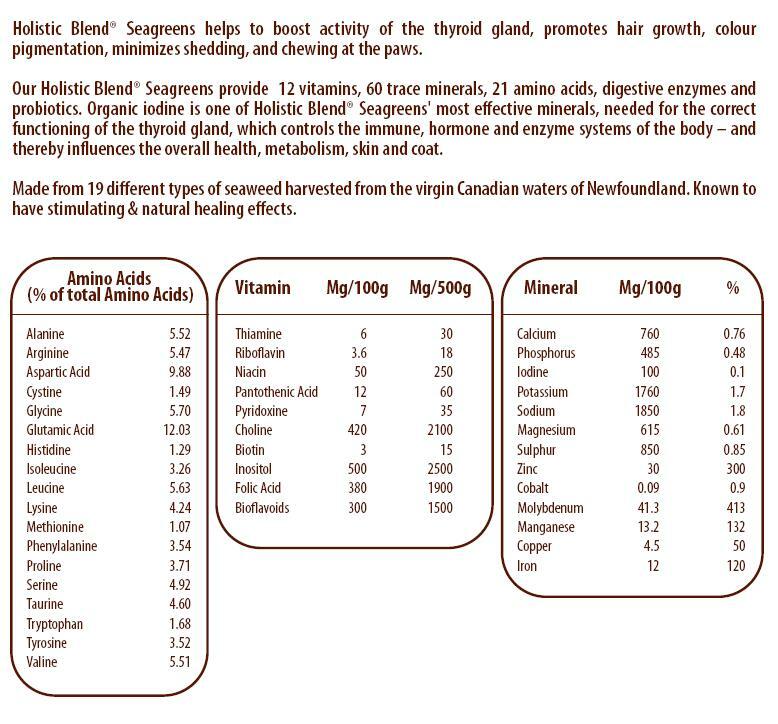 Holistic Blend Seagreens Powder. Liquid Seagreens also available. Available in Canada and several states. See nutritional analysis for more information (note that amounts given are per 100 grams; there are about 5 grams in a teaspoon). Wysong Wild Things veggie and fruit formula. Azmira Mega Pet Daily Mega Pet Daily is "a high potency, quality, nutritional supplement of vitamins, minerals, and amino acids in a base of Alfalfa, Watercress, Parsley, Rice and Lecithin." Canine Sports Basics (soon to be replaced by the original Canine Basic Nutrients) and Canine Geriatric Basics from Thorne Veterinary (303) 702-1986. Available from Wellvet, and HolisticPetInfo. Basic Nutrients are combinations of whole food and synthetic nutrients, designed to provide "optimal levels of most important nutrients for optimal body functions." Thorne Research vitamin supplements are hypoallergenic and contain no fillers, so may be a good choice for dogs with food allergies. The geriatric formula contains acetyl-l-carnitine plus alpha lipoic acid, which have been shown to aid memory and ability to learn in older dogs. See Acetyl-l-carnitine and α-lipoic acid supplementation of aged beagle dogs improves learning in two landmark discrimination tests for more information. Canine Plus and Canine Plus Senior from Vetri-Science. Available from HolisticPetInfo, KV Vet, and PureFormulas. Also called Top Dog from Mountain Naturals, and Canine Discovery from US Animal Nutritionals. These products are made by the same manufacturer as Cell Revive below. Cell Revive 440/880 is an antioxidant supplement that provides a variety of vitamins and minerals. It does not include a B-complex vitamin, which should be given separately. Note this supplement is identical to Cell Advance by Vetri-Science (also available at KV Vet) and Cell Discovery from US Animal Nutritionals. Also available at Holistic Pet Info and Amazon. Doc's Best Multi A human additive-free supplement that can be used for dogs with allergies. DogZymes Ultimate from Nature's Farmacy uses a combination of whole foods and synthetic nutrients. This supplement helps balance homemade diets better than most standard canine vitamin-mineral formulas. Dr. Ian Billinghurst's Canine Nutritional Supplement from Veterinary Nutrition Essentials. Contains vitamins, minerals, digestive enzymes (from pancreatin), probiotics, glucosamine and chondroitin, some from whole foods. Mineral amounts are high; I would not give more than half the recommended amount if you are feeding a commercial diet. This supplement is quite expensive, so if you don't need everything it contains, you could probably find something more reasonable. Grandma Lucy's Vitamin Balls Combination of human-grade whole foods and synthetic vitamins and minerals. Puritan's Pride Green Source Multi-Vitamins and Minerals Combination of whole foods and synthetics, this supplement provides a significant amount of most vitamins and minerals. Small Animal Antioxidant and Immugen from Thorne Veterinary. Available from Wellvet, 303-702-1986 and HolisticPetInfo. The following supplements are recommended by some veterinary nutritionists to help balance homemade diets (note that calcium must still be added separately unless you feed raw meaty bones). Give about 1 tablet per 20 pounds of body weight daily. See Guidelines for Adding Supplements to a Homemade Diet for more information. Allergy Research Nutricology Multi-Vi-Min This is a human supplement that is often recommended for dogs who have severe food allergies. There are multiple versions available. In general, I would recommend the one with iron and copper.Children's version may be used for very small dogs. Doc's Best Multi Another human additive-free supplement that can be used for dogs with allergies. Keep in mind that dogs may react to fillers or flavorings in supplements, or to the capsule itself rather than its ingredients. If your dog is allergic to one form of a supplement, he may be OK with a different brand. If your dog has allergies, you may want to stop all supplements for a few weeks to see if things improve. If so, you can then reintroduce supplements one at a time, waiting at least a week in between each one, to try to identify which one(s) your dog is reacting to. Also see Digestive Disorders section. Pet Tabs have been found to be contaminated with lead by Consumer Lab in both 2007 and 2009. Pet-Tabs Complete Daily for Dogs was most recently found to be contaminated with 6.45 mcg of lead per tablet. California requires warning labels on supplements for human use that contain over 0.5 mcg of lead per day.